The term ‘shoulder instability’ is used to refer to the inability to maintain the humeral head in the glenoid fossa. The ligamentous and muscle structures around the glenohumeral joint, under non-pathological conditions, create a balanced net joint reaction force. The relevant structures are listed below. If the integrity of any of these structures is disrupted it can lead to atraumatic or traumatic instability. Atraumatic instability commonly results from repetitive overhead movements or congenital joint features. Traumatic mechanisms of injury may result in frank dislocations where there is a loss of joint integrity. Instability can occur anteriorly, posteriorly, or in multiple directions regardless of mechanism of injury. Traumatic instability of the shoulder is a common condition, which, especially in young patients, is associated with high recurrence rates. Among the different types of this joint instability, the anterior dislocation due to trauma is the most common type, corresponding to more than 90% of the cases. 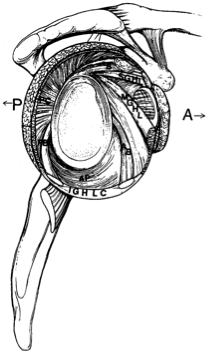 Laxity of structures in the shoulder which may be present since birth. May be seen after surgery for shoulder dislocation, due to glenoid rim lesions. Over time, microtrauma can lead to instability of the glenohumeral joint. The proprioception mechanisms of the shoulder joint have been investigated and found to be closely related to the response of the dynamic muscle stabilisers. Various histological studies in anatomical specimens have confirmed the presence of afferent nerve endings (Ruffini corpuscles and Pacini) and their distribution in the shoulder capsuloligamentary complex. Cuellarsuggests that shoulder instability can be due to injury and/or failure of the static capsulo-ligamentary stabilizing elements, which are supporting the sensitive afferent ending, this alteration of the passive stabilizing elements causes a disturbance or delay in the delivery of the proprioceptive signal causing a delay and/or error of coordination of the corresponding muscle response. The dynamic stabilizing mechanism is thus altered and the loss of joint congruity is facilitated. This interval is a triangular-shaped area found in the shoulder, with borders noted below. A large rotator interval allows for increased anterior humeral head translation due to the lack of structures supporting the joint capsule anteriorly. Anterior capsule Posterior capsule Joint capsule in 2 or more directions. Inferior capsule is primarily affected. 98% of primary dislocations occur anteriorly. 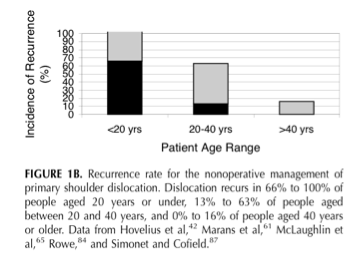 The rate of recurrence is most common in younger populations (see figure 1B3). The incidence of congenital instability is unknown. The most common glenohumeral dislocation occurs anteriorly, usually as a result of sporting accidents or falls, particularly when the upper extremity is in 90° abduction and external rotation. Posterior dislocations most commonly result from seizures, shock and falls. Caused by repetitive extreme external rotation with the humerus abducted and extended (i.e.pitching motion). Instability may be caused by gradual weakening of the anterior and inferior static restraints. The humeral head will tend to move away from shortened structures. For example: posterior shoulder capsular tightness will cause the humeral head to shift anteriorly, resulting in a loss of integrity of all anterior structures. Commonly associated with participation in sports such as gymnastics, baseball, softball, tennis, swimming, and weight training. The patient lies on their back with the scapula on the table but the caput free. Load the caput humerus into the glenoid and then translate the caput in the anterior and posterior directions. The test aims to evaluate the amount of translation of the caput humerus on the glenoid. There are many methodes to grade the test but the most common one is the Hawkins grading. This method is considered to be the best one because it has a clinical basis. Hawkins divided the movement in four grades: Grade 0 = little to no movement; grade 1 = the humeral head rises up onto the glenoid rim; grade 2 = when the caput humerus can be dislocate but relocate spontaneously; grade 3 = when the head does not relocate after the pressure. Tzannes and Murell  have concluded that this test is entirely reliable (p<0,0001) and a LR > 80 for instability. The patient is positioned supine. The examiner holds the patients scapula with his left hand while grasping the patient’s upper arm and drawing the humeral anterior head with his right hand. You can hold the shoulder in a different position. The test tells you more about the laxity. The test is positive when the thumb was felt to slide past the coracoid. Tzannes and Murell  have concluded that this test is still to be assessed as to its validity and reliability. This manoeuvre tests the superior glenohumeral ligament. The test is positive when there is a sulcus of more than 2 cm between the acromion and caput humerus. Tzannes and Murell also evaluate this test as being completely reliable (p<0,0001). Nakagawa et al report a specificity of 0.93. In this test, the examiner applies posteriorly directed force to the humeral head, with the patient being in abduction and external rotation. The test is positive in case of pain or apprehension when easing the pressure. In the light of the results of Tzannes and Murell (p<0,0001) and Ian et al  we can conclude that it is a reliable test for the detection of the unstable shoulder. Gross et al report a sensitivity of 0.92 and a specificity of 0.89, making this test useful to rule out shoulder instability with a negative result. The apprehension test is being applied when the patient is lying or sitting with the shoulder in a neutral position (90° abduction). The examiner holds the patient’s wrist with one hand and with the other hand he applies anteriorly directed force to the humeral head. Signs of glenohumeral anterior instability are: pain, a feeling of subluxation or clear defence. If a relocation test is being applied almost immediately after the apprehension test and if this relocation test results to be negative, than we can decide that there is anterior instability. Based on the results of Levy et al. ; Ian et al. (sensitivity = 53 & specificity = 99), Tzannes and Murell  (p= 0,0004 pain and/or apprehension and a LR 8-100 for anterior instability) and Marx et al., we are able to conclude that there is not sufficient clinical proof to detect or exclude instability. Lo et al report a specificity of 0.99. The patient is in the starting position of the apprehension test and the examiner now applies posteriorly directed force to the humeral head. When this test results to be negative, there is glenohumeral anterior instability. The article by Ian et al. (sensitivity = 45 & specificity = 54) states that the relocation test is not clinically evident. However, other articles by Tzannes and Murell (p= 0,0003 pain and/or apprehension) and Liu et al. provide evidence to the contrary. Lo et al report poor psychometric properties on this test. Medical management will hinge on the specifics of the patient presentation including the mechanism of injury, severity, patient goals, etc. In some cases, particularly those with a traumatic mechanism, surgical intervention may be warranted to restore joint stability. In one studie participants undertook the Watson multi directional instability rehabilitation program that focused on regaining stability and control of muscles acting on the glenohumeral joint and scapulothoracic joints and gradually progressing the shoulder into functional positions and activities.The program, which has been published in detail was advised and monitored by the author (L.W.) and required participants to attend rehabilitation once weekly for 12 weeks. Results of all of the muscle strength tests evaluated in the current study demonstrated signiﬁcant improvements at follow up, with the standard mean differencecs demonstrating moderate to large effects. (LOE: 4). Two studies described excercise therapy after Bankart and reverse Bankart. In one studie patients were operated with two biodegradable anchor sutures (artroscopic Bankart). after surgery, the patients wore a shoulder immobilizer for 3 weeks. Isometric exercise in the sling was started at 1 day postoperatively. Increasing range of motion exercises were prescribed for 2 weeks after surgery. The shoulder immobilizer was removed, and active flexion exercise in the supine position and passive external rotation exercise were started at 3 weeks postoperatively. Rotator cuff exercise was started using a rubber band at 4 weeks postoperatively, and unlimited activities of daily living were allowed at 6 weeks postoperatively. Upper limb muscle training was permitted using a <2kg dumbbell at 2 months, and push-ups were permitted at 3 months. Noncontact sports were permitted at 2 to 3 months, and contact sports and overhead throwing were permitted at 6 months. Posterior shoulder instability can be further divided dimensionally: unidirectionally (posterior), bidirectionally (posteroinferior), and multidirectionally (posterior, inferior, and anterior). Bidirectional and multidirectional instability are much more common than unidirectional instability. Specific pathoanatomic lesions, such as a reverse Bankart lesion, are often observed in patients with posterior instability caused by trauma. Multidirectional instability may have an inciting traumatic event, but it is due to preexisting global capsular laxity. Glenohumeral instability is a multifaceted disorder with varying causes, degrees, and directions of instability. Conservative physiotherapy management is recommended as the primary option for treatment. If conservative treatment is unsuccessful after a 6-month course, surgery may be considered. For the first month, the shoulder should be kept in relative external or neutral rotation to relax the posterior capsule and antevert itself. Between the first and second months’ postsurgery, passive and active assisted range of motion can begin in a protected fashion while still limiting end ranges of motion in positions that maximally stress the posterior capsule. The sling use may be discontinued around 6 weeks. Shoulder instability may have a traumatic or atraumatic cause. There is a high recurrence rate after a primary shoulder dislocation, which is greatest in individuals < 20 years old. Rehabilitation should be based on each individual patient’s case with consideration to the type of surgery and surgeon’s preference where surgery is undertaken. ↑ Tzannes A, Murrel, GAC. An assessment of the interexaminar reliability of tests for shoulder instability. The journal of Shoulder and Elbow Surgery 2004; 13:18-23. ↑ Rosa JR, Checchia CS, Miyazaki AN. Traumatic Anterior Instability of the Shoulder. Revista Brasileira de Ortopedia. 2017;52(5):513-20. ↑ Barrett C. The Clinical Physiotherapy Assessment of Non-Traumatic Shoulder Instability. Shoulder & Elbow. 2015 Jan;7(1):60-71. ↑ 4.00 4.01 4.02 4.03 4.04 4.05 4.06 4.07 4.08 4.09 4.10 4.11 4.12 Guerrero P, Busconi B, Deangelis N, Powers G. Congenital instability of the shoulder joint: assessment and treatment options. JOSPT. 2009;39(2):124-134. ↑ Charousset C, Beauthler V, Bellaïche, Guillin R, Brassart N, Thomazeau H. Can we improve radiological analysis of osseous lesions in chronic anterior shoulder instability? Orthop. Traumatol. Surg. Res. 2010;96:88-93. ↑ 6.0 6.1 6.2 6.3 Cuéllar R, Ruiz-Ibán MA, Cuéllar A. Suppl-6, M10: Anatomy and Biomechanics of the Unstable Shoulder. The open orthopaedics journal. 2017;11:919. ↑ 7.0 7.1 7.2 Hayes K, Callanan M, Walton J. Shoulder instability: Management and rehabilitation. JOSPT 2002;23(10):497-509. ↑ Jaggi A. Rehabilitation for shoulder instability. Br J Sports Med 2010;44(5):333. ↑ Yang J, Lin J. Reliability of function-related tests in patients with shoulder pathologies. JOSPT. 2006;36: 572-576. ↑ Gross M, Disefano M. Anterior release test: A new test for occult shoulder instability. Clinical Orthopaedics and Related Research. 1997;339:105-108. ↑ Tzannes A, Murell GAC. Clinical examination of the unstable shoulder. Sports Medicine 2002; 32: 447-457. ↑ Ian KY, Lo IKY, Nonweiler B, et al. An evaluation of the apprehension, relocation, and surprise test for anterior shoulder instability. American Journal of Sports Medicine 2004; 32:301-307. ↑ Levy AS, Lintner S, Kenter K, et al: intra- and interobserver reproducibility of the shoulder laxity examination. The American Journal of Sports medicine 1999; 4: 460-463. ↑ Marx RG, Bombardier C, Wright JG. What do we know about the reliability and validity of physical examination tests used to examine the upper extremity? Journal of Hand Surgery 1999; 24A:185-193. ↑ Liu SH, Henry MH, Nuccion S, et al. Diagnosis of glenoid labral tears. A comparison between magnetic resonance imaging and clinical examinations. The American Journal of Sports Medicine 1996; 2:149-154. ↑ Rouleau D, Faber K, MacDermin J. Systematic review of patient-administered shoulder functional scores on instability. J Shoulder Elbow Surg. 2010;19:1121-1128. ↑ Mintken. Some Factors Predict Successful Short-Term Outcomes in IndividualsWith Shoulder Pain Receiving Cervicothoracic Manipulation: A Single-Arm Trial. PTJ 2010;26-42. ↑ WATSON, Lyn, et al. The effects of a conservative rehabilitation program for multidirectional instability of the shoulder. Journal of shoulder and elbow surgery, 2018, 27.1: 104-111. ↑ AMAKO, Masatoshi, et al. Recovery of Shoulder Rotational Muscle Strength After Arthroscopic Bankart Repair. Orthopaedic journal of sports medicine, 2017, 5.9: 2325967117728684. ↑ TANNENBAUM, Eric; SEKIYA, Jon K. Evaluation and management of posterior shoulder instability. Sports Health, 2011, 3.3: 253-263.